A friend emailed me this verse the other day and reminded me of the renewal that happens in a "wait". I have always loved this verse, even when I was a little girl. It's such a beautiful picture and has some amazing deeper truths inside of it when we study the eagle and the flight pattern of the eagle rising above. But what touched me the other day about this verse was the latter part, "they shall run and not be weary, they shall walk and not faint". Can you imagine running and not being weary. Walking and not being faint. Wow! Think on that promise for a bit. Another translation reads: "But those who wait for the Lord [who expect, look for, and hope in Him] Will gain new strength and renew their power; They will lift up their wings [and rise up close to God] like eagles [rising toward the sun]; They will run and not become weary, They will walk and not grow tired." How many of us are constantly on the run? Maybe we are raising a family and get up early to pack lunches and whisk the kids out the door, stock Gatorade in our cooler for the after school soccer game, have half hour between the game and youth group to feed our babes so McDonald's drive-through becomes a routine. We drop off at youth group, pick up before bed, baths and then fall into bed (everyone) exhausted, only to start that all over again the next day, and if you have toddlers in the mix the diaper bag, baby food and naps snuggles are all inter-twined. 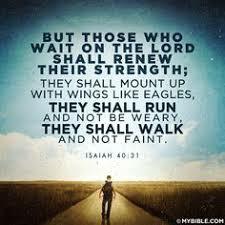 You would look at a verse like Isaiah 40 and think "I dream of running and not being weary". But yet this is a promise (yes and amen) inside of Jesus. This promise is attached to the condition of . . . . "they who WAIT ON THE LORD". Everyone has their own schedule in a day, some may look very different and not even be able to relate to the above example, but we all know the feeling of weariness. I would suggest that in order to run and walk in a place of renewed strength and vigor we must guard our time where we "wait on the Lord". This may mean to set aside time for just you and Him (I call my time like that a quiet time) or it may mean that you are in a period of waiting. Waiting for promises fulfilled, waiting for breakthrough. Either way God has amazing promises for those who wait! I find that when I set aside intentional time of being with the Lord, my entire being is renewed and often I accomplish more than I ever could have, had I not taken that time to "wait". This morning, I had good intentions of being up early to give Jesus all my attention. I smacked the alarm clock when it went off at 5:00 am a few times and wished the next 5-10 minutes would be like 5 hours more of sleep. Ha! God gets it! He was tempted like us, but He invites us into a life that is full of renewed vigor, strength and free from weariness when we wait on Him. And just one more closing verse that I absolutely love pertaining to waiting on the Lord. Being in that place of waiting, trusting, abiding, yielding . . . These are incredible promises attached to "the wait". Video: Kristene DiMarco "He's in the Waiting"
"For the Lord God is our sun and shield. He gives us grace and glory. 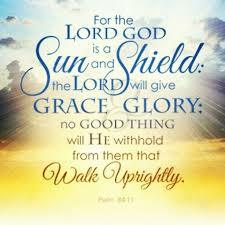 The Lord will withhold no good thing from those who do what is right." The verse goes on to say, "He gives us grace and glory". Simply stated, He gives us His divine enablement along with all the fullness of Himself made manifest. The combo of grace mixed with glory is like the brightness of the sunrise, blasting in brilliance, radiating Jesus, obliterating darkness. How incredible we are if we receive this power packed combo of Grace and Glory and release it in our lives! And then tacked onto the end of this scripture is the promise, "The Lord will withhold no good thing from those who do what is right." This is a great verse to claim when everything is going good. But when disaster is looming and trouble surrounds us (our nation) , this verse becomes an anchor for our faith. We attach our faith to these promises that God is good and will not withhold from us as we walk before Him in righteousness. Just some thoughts to ponder today . . .
For those of you who are women in some form of Christian ministry (including the home front and raising kids full time), I invite you to check out Patricia King's Women In Ministry Network. It's a great network of women from all walks of life and different places around the globe who are in ministry. I facilitate a small group within this network of women and they are all such incredible gems! 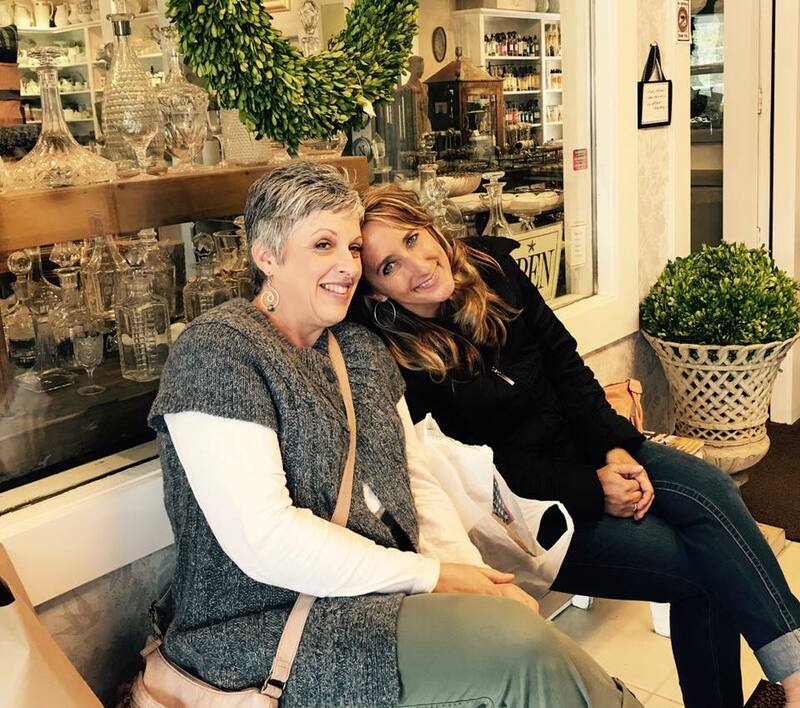 We meet a couple times year and share about our ministries, testimonies, ups and downs and pray for each-other. This last time the gals met at my house there were a little less than half of us and I snapped this picture below. It was a sweet time and we ended the time joined hands and singing, "Oh Come Let Us Adore Him". We have a few highly gifted worship leaders in our group and so the sound was like heaven echoing through my great room . . . "For He Alone Is Worth!" If you are interested in networking on-line with women across the globe who are on the Frontlines in ministry - come and join us! Rest inside of Jesus, does not mean (though it can) crawl into bed and take a nap or slow down and take a vacation. Rest inside of Jesus is His ability and power working through you to accomplish what is in front of you. It’s like when my husband John wants me to “rest” in the passenger seat and let him drive. I cease from my striving to control (or freak out) the driving behavior of my mate and I rest in His ability to navigate the road. Ha! Silly example but true. To rest inside of Jesus, we come to Him, who is already inside of us (if we have given our life to Him) and surrender, yield to His peace, His truth, His right way (righteousness). “Why do you call me, ‘Lord, Lord,’ and do not do what I say? As for everyone who comes to me and hears my words and puts them into practice, I will show you what they are like. They are like a man building a house, who dug down deep and laid the foundation on rock. When a flood came, the torrent struck that house but could not shake it, because it was well built. I love this song by Bethel Music entitled, “Come To Me” . 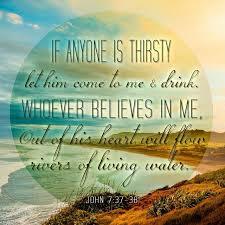 . .
Today, may the Father draw us to Jesus and may we COME TO HIM our Bread of Life and not be hungry or thirsty. May we put into practice and obey the words He speaks to us. May we pull our plate up to the buffet table of Jesus and eat and drink of His comfort, His peace, His thoughts, His joy, His guidance, His provision, His health, His hope, His perspective, His life . . . May we BELIEVE He is who He says He is. May we build a firm foundation on the rock of Christ that cannot be shaken through the violence of life storms. May we come to Him and be sustained in His presence, nourished through His words and may rivers of living water (the abundance of His Spirit) flow from within us and into everything we are facing in life this day. Sometimes all we can do is “Come” and trust Him to do the rest . . .
Blogger Friends - It's OCTOBER!! I always blog more in the month of October. I sometimes go dormant and then will usually always pop up again with photos of my family, maybe a few sneak peaks at my friends and an occasional thought (Nita's Thoughts) in the month of October. I always have loved to blog in October. Not sure why . . . maybe kids are back to school and I have more quiet think time, maybe change in seasons brings change in focus, who knows! :-) Ha! So, I hope you are enjoying a few more photos, some peaks into my life and feel free to sign up for feed-burner so you can share your thoughts and comments with me via email. This is my prayer for you today . . . DOOR. 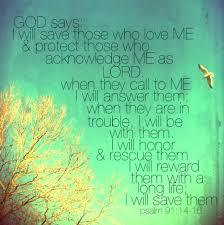 If anyone enters by Me, he will be saved." 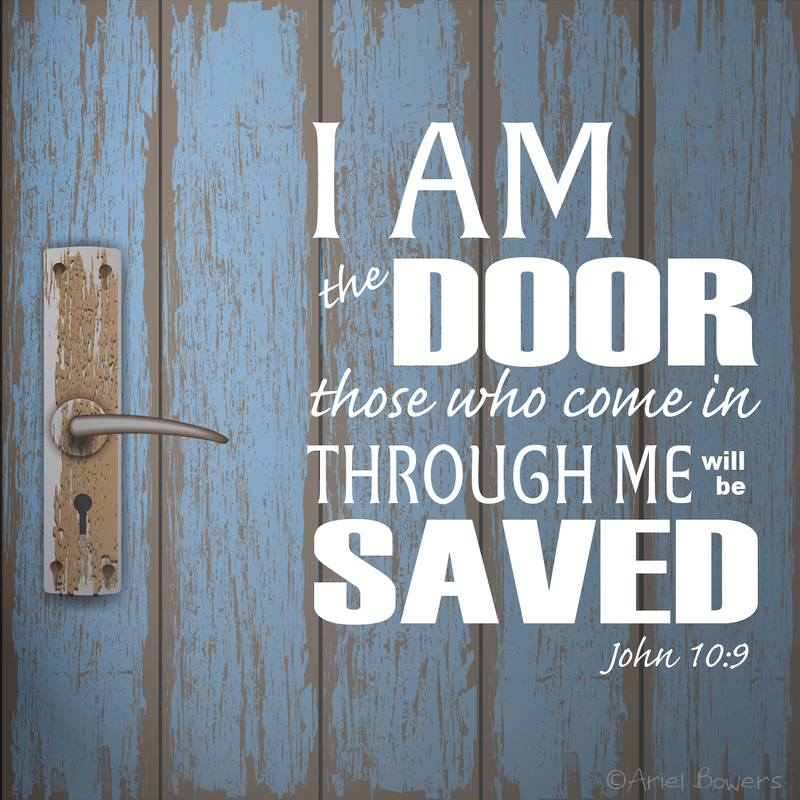 This is clearly defining Jesus as THE DOOR, the one and only way to salvation and relationship with God. But interestingly He calls Himself THE DOOR. Therefore, I love looking at Revelation 7 like this, "See, I have placed before you an open door that no one can shut . . . See, I have placed JESUS before you and He is never shut. He has forever opened Himself and the heavens, in a path to the Father and a path to fullness of life. He is the door to our future. 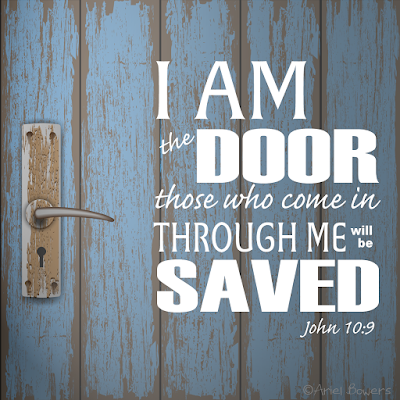 He is the door to our destiny. He is the door of rescue, love, honor, resource, favor, comfort, blessing, hope, safety, abundance, peace, life, health, unity, prosperity, deliverance, etc. I could go on and on and on. There are some other great scriptures on doors that I could elaborate on, but for the sake of time, I'm just thinking this morning about the prayer, "Jesus, please open doors that no man can close for my friends . . . Jesus, thank you that you have opened yourself to us and inside of you is everything we need for life (2 Peter 1:3)." The door is open to us in Jesus today. Always In Your Thoughts . . .
"Lord, in my place of weakness and need, won't you turn your heart toward me and hurry to help me? For you are my Savior and I'm always in your thoughts." 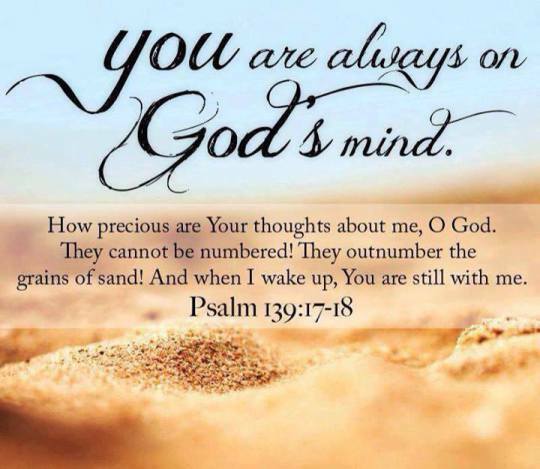 I read this passage this morning and loved the line, "I'm always in your thoughts". How many of us, when we are in that place of weakness and need, want someone to come along side of us, give us attention, comfort us and fill the need? Some of us who are more extroverted, want that more than others. :-) ha! But seriously, when I am in a place of weakness I love it when my husband or close friends, turn their hearts and thoughts towards me and help strengthen me. But honestly, the One who does it best, knows me best and goes to the root of why I'm in need in the first place, is my Savior. I love how this verse says it so beautifully, I am always in His thoughts. That makes me feel super secure. That right there is an anchor for my soul. I love this quote, and find it to be so true of my closest friends. This summer I celebrated my girlfriend, Karla's 50th birthday! We have been friends since I moved to Brownsville, Oregon when we were thirteen years old. All of the girls around the table in the photo above have been friends since jr. high or high school. we had so much fun all getting together at the Oregon coast for a few days of celebration in honor of her 50th. Linda and I were in the same graduating class in high school and used to sing in the choir. We also had a small singing group of three that traveled around the local area. We could kill the harmony and make churches resound. Fun times!!! Annie was every guys dream (ha! :-) and I could not go anywhere with her without everyone commenting on her gorgeous long hair and her spunky personality that engulfed those around her. She is now one of the anchors of prayer and support in my life. Karla, like the quote above, has been full of grace and a devotion to God that is anchored, truthful moments, forgiveness, unselfishness, boundaries that keep our relationship healthy, care for my family and gigantic love and generosity towards me and so many others. I am so much richer due to her friendship. Here are a small handful of pictures of my dear friends and the memories we made this birthday celebration . . .
Karla's Birthday Cake - we ate on it all weekend! I was asked to share a nugget this week at a women's gathering on Honor. 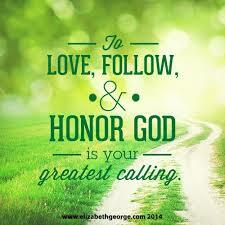 When I thought about what nugget I would share, I was overwhelmed with how many things I could say about honor. The scriptures are full of verses regarding "honor". But I always think it's fun to share from current personal life experience when possible and this is what God has been stirring in me regarding Honoring Him . . . I believe a practical nugget or key if you will, to honor is THANKSGIVING. 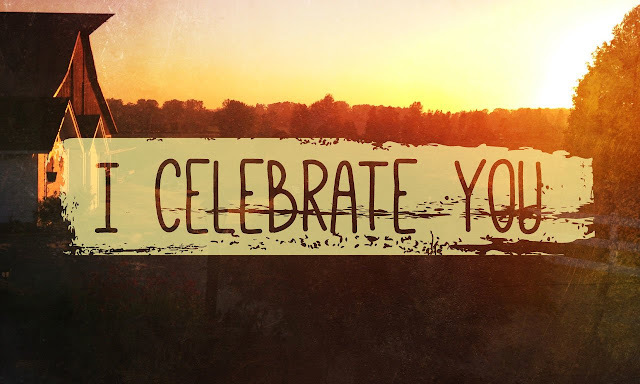 When I thank God for what He does in my life, I am positioning myself in honor before Him. I have been challenged lately to pause and turn my heart and mind towards God and thank Him in specific situations. For example, if I am going into a life circumstance and I specifically ask Holy Spirit to help me, then I ask Father to provide something and I receive from Jesus what I need (grace) and the circumstance I encounter is successful. I am working on trying to remember afterwards, to turn my heart to Holy Spirit and thank Him for standing beside me and helping me (give Him specifics), then I may turn in my heart and imagination towards Father and thank Him for the way He moved and answered and provided (specifically) and lastly I would thank Jesus for what He purchased on the cross so that I could walk in whatever I just received from Him. It's an act of Hosea 6:3 acknowledging Him through thanksgiving and honor. One definition of Honor is: to give special recognition to. When we turn our hearts towards the Godhead and acknowledge their working in our life, and their faithfulness in our lives, It positions us in honor. Remember the story of the ten lepers in Luke 17. Jesus heals them all but only one came back and thanked Him. "When one of them saw that he was healed, he came back. He praised God in a loud voice. He threw himself at Jesus' feet and thanked Him." ~ Luke 17:15 I can tell you that if I was Jesus, I would not have felt very honored by the other nine. In fact, Jesus asks in verse 17 the one who returned where the others were. My kids are pretty amazing when it comes to thankfulness. They will often thank me for a meal I make or if I buy them a treat at the store, etc. I love it when they thank me, it makes me feel honored. Destiny overflows with thankfulness and affection for the little things I do for her. Simeon gushes when I buy him things and thanks me over and over. Julie makes cards for me that describe her thankfulness. I'm especially honored when they are with their friends and their minds are busy and bodies are active and they pause and turn to me and thank me for something I have just done. What a picture of us and God. Life can be crazy busy, and it's easy to forgot to thank God in the midst of it, but when we turn our hearts and minds towards Him and acknowledge Him through honor, Hosea says "He comes to us". Wow, what a beautiful picture. When I honor God by being thankful it produces a greater intimacy/closeness with Him. This week can I challenge us to Honor Holy Spirit as he comes along side us and is our Paraclete our Helper. Honor Father God, as He moves on our behalf and we see things shift and change around us. And Honor Jesus as His grace abounds and He gives to us above and beyond all we could ask or imagine in abundant life and soul health.